You may remember TechCrunch Disrupt winner Soluto, which helps bring an end to PC user frustration from printing problems, annoying add-ons, apps that crash, resource hogs, and those frustrating applications that randomly cause your mouse to become useless for a few seconds at a time. As we’ve written in the past, the advantage to using Soluto (which is focused purely for the PC) is that the SaaS records which applications were running at the time of the hiccup, and analyzes low-level events to track things users aren’t even aware of, like which applications are competing for memory. Today, the company is launching an iteration of its software, which includes a browser product and application crashing product, that makes its even more powerful. Basically, once downloaded, Soluto analyzes your PC, suggests numerous fixes, including ‘like omitting certain applications from your bootup. It can show you your computer’s speed over time, mapping out when you installed a certain application — so you can see what led to the problem. Soluto takes user-submitted data from its application and uses it to figure out which software works best on each computer. It can identify which hardware has had issues with which software. It can also help you pick out software that runs well on the specific model of PC you’re using, based on other users. As we wrote above, Soluto allows you to discover which applications are slowing it down (and keep running later in the background, affecting your ongoing experience), and allows you to improve this experience by disabling these applications. 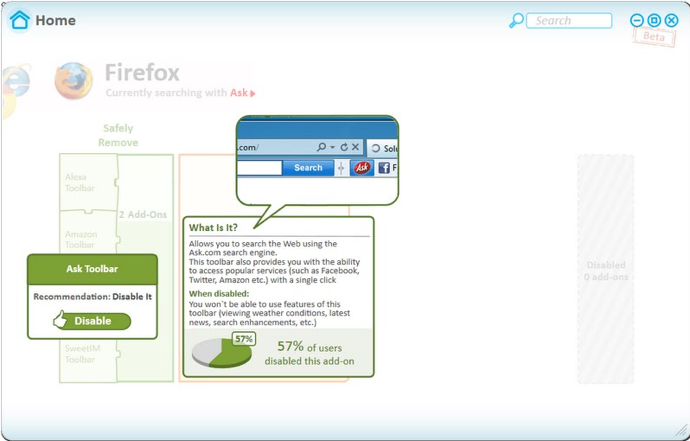 Today, the company is launching a tool for your browser that will show you which toolbars, add-ons and plug-ins are on your browser, what they do, and what they look like. With a single click you can remove unneeded ones. It also lets you revert back to your search provider of choice (Yahoo, Bing or Google) in case it was ‘hijacked’ by other software. The new tool will also show you what percentage of users removed each add-on or toolbars so users can determine if it makes sense to remove the plugun. Another addition to the Soluto product changes the way you experience application crashes (that is, when applications unexpectedly ‘die’ and prompt Windows to send ‘Crash Report’ dialogs). Soluto analyzes application crashes against tens of millions of crashes already collected, and finds solutions to prevent them from recurring. While some application crashes don’t have a solution, Soluto will show you what probably caused the crash and allows you to send in a form so that Soluto can possible crowdsource the answer to the problem. This anonymous technical data is gathered and sent to Soluto’s PC Genome, a knowledgebase containing statistical insights about PC software and hardware behavior, as well as remedies to alleviate PC usage frustrations. For example, 25 percent of Internet Explorer users suffer from crashes once a week. 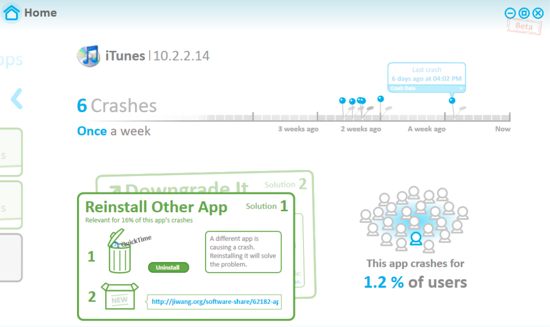 And 18.6 percent of those crashes are from Adobe’s Flash. Soluto, which is free, has had 2 million downloads since the company debuted its product to the public last year. And that’s without any real marketing or advertising for the software. What makes the application so successful is that it is incredibly easy to use, even for those with limited technical knowledge. Next up, the company says it will be tackling other platforms (Mac OS, please? ), including mobile.